Some events don’t allow entry deferrals for any reason, including when you’re expecting a child. Sarah Buccleugh never imagined herself a Boston Marathon qualifier. She finished her first 26.2-mile race, the 2014 New York City Marathon, in 4:46, more than an hour from her age group’s qualifying time. But after moving from her Bronx home, where she ran primarily on trails, to Manhattan, she found herself picking up speed on the Central Park roads. By joining a running club, Buccleugh added tempo work to the mix. Four years later, at the 2018 New Jersey Marathon, the 36-year-old special education teacher whittled her time down to 3:54, which left 14 minutes to a BQ. Now the goal felt within reach, so Buccleugh went for it in July at the 2018 Revel Mt. Hood Marathon. She surprised herself by finishing in 3:32, a Boston qualifier by more than seven minutes. It wasn’t the only startling thing to happen at the time, as it turned out. The same September day that Buccleugh registered for the 2019 Boston Marathon, she also found out she was pregnant. Because this is her first pregnancy, Buccleugh also didn’t know what to expect from her next nine months of running. 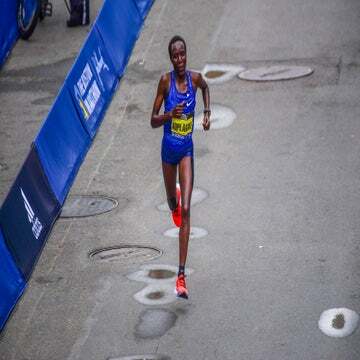 She was able to finish the New York City Marathon at 12 weeks pregnant and remained hopeful for Boston. But by January, it became clear that running 26.2 miles at eight months pregnant wasn’t in the cards. Buccleugh decided to look up the Boston Athletic Association’s deferral policy and was upset to learn that it was not an option, whether for injury, pregnancy, or even military service. Officials said they don’t have the capacity to process the requests. Each year, in fact, the BAA receives myriad requests for a variety of reasons. For Buccleugh, the policy is disappointing. But the Boston Marathon is one of several marquee events that don’t grant deferrals. The iconic Ultra Trail Mont Blanc (UTMB), which circumnavigates the tallest Alp through three countries, is another example. Oddly, UTMB organizers allow deferrals for injuries, but rule against pregnancy requests, explaining that they do not want injured runners to risk further harm to themselves by starting the event. The policy has not gone unnoticed: competitive ultrarunners like Stephanie Case, who is also a human rights lawyer, and Lizzy Hawker, five-time UTMB champion, have drawn attention to the matter by publicly speaking out against it. Qualifying for UTMB requires accumulating points over a period of years. For the 2019 race, participants must have accumulated 15 points from a maximum of three specific qualifying races between January 2017 and December 2018. Women who become pregnant forfeit that hard work and have to start all over again, postpartum. British ultrarunner Sophie Power, 36, made headlines last year for a photograph of herself at an aid station, where she had stopped to nurse her baby during UTMB. When asked why she chose to compete, she pointed out that she had missed the race in 2015 due to pregnancy with her first child. After earning enough points to enter a second time, she became pregnant and had a second child. Still eligible, she chose to run, even if it meant slowing down to nurse along the way, rather than losing a second chance at taking on the mountain. And still it goes on. Because a conversation has been started which we should never allow to stop. That women have the same right to set ourselves goals, to dream and to achieve them. And that does not change when we become mothers – it only burns stronger as we strive to show our daughters and sons what women can do. Thank you to @katherine_m_turner for your beautiful article (link in bio) which puts this into words far better than I ever could. And to @strava for actively standing in our corner. Who will join them? 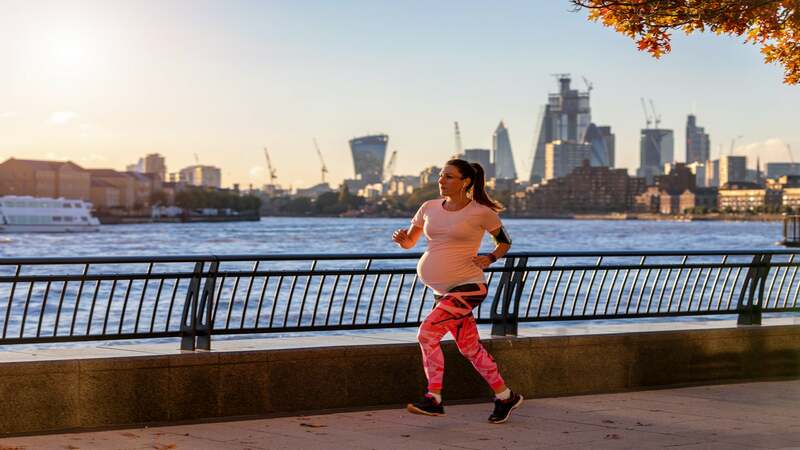 Other race directors see merit in offering pregnancy deferrals, although in the case of the biggest marathons, it isn’t a distinct category, rather part of an umbrella policy. The New York City Marathon allows all participants to cancel a paid entry for one year—the runner loses the registration fee, but gets a guaranteed spot for the following year’s race by paying a new fee. Chicago and London marathons have similar rules. The Western States Endurance Run offers a more specific policy for women, which was put into place in 2018. Craig Thornley, the race director, said that because qualifying for the 100-mile race is a multiyear process, it is unfair to punish women for taking time off to have children. Runners get into Western States via two avenues: by lottery and running a qualifying race in an allotted period of time, and through invitations that come by way of “automatic” qualifications. These include criteria like placing in the previous year’s top ten, winning qualifying races, and volunteering with a club. The rules allow women to take up to three years to run the race if they become pregnant after getting an entry or hold their spot in the registration lottery. This year, Western States also implemented a transgender entrant policy. A male-to-female transgender entrant can register to compete as a female, provided the runner has been undergoing continuous, medically supervised treatment for gender transition for at least one year prior to the race. A female-to-male transgender entrant can register to compete as a male with no restrictions. But as Buccleugh prepares to sit out the 2019 Boston Marathon, she as no idea when she might get another crack at making it to the starting line in Hopkinton. It’s time for the organization to change its rules, she said.